Milpitas apartments offer luxury living in a lively suburb just 10 miles from downtown San Jose. These modern Milpitas apartments are located between I-880 and I-680, just across the street from Dixon Landing Park and down the street from the Sunnyhills Shopping Center. Everything you need is close at hand. Our Milpitas apartments are a convenient choice for employees of local companies like SanDisk, LifeScan, Cisco Systems and Linear Technology. Other Silicon Valley corporations like Google and Apple are easy to reach by car or public transportation. If you have children, you will appreciate the Milpitas Unified School District’s highly-rated academic, sports and special education programs. Russell Middle School and Milpitas High School are only a mile away. Milpitas is known for its public art, including the ceramic tower at Hillcrest park and the sundial at Augustine Park. Residents of our Milpitas apartments can enjoy the area’s many restaurants and recreational programs. The city is also home to the largest indoor mall in the San Francisco area, the Great Mall of the Bay Area. The massive single-story structure houses several department and outlet stores, as well as a Van’s skatepark, a multi-screen cinema, cafes and restaurants. Our Milpitas apartments offer amazing amenities including hiking/jogging trails, swimming pool, hot tub and picnic areas. The clubhouse includes a fitness center, media room, laundry facility and game room with billiards, air hockey, and foosball. The spacious apartments have unique amenities such as fireplaces, walk-in closets, fully equipped kitchens, and vaulted ceilings. Milpitas apartment communities are pet-friendly and also feature reserved parking. 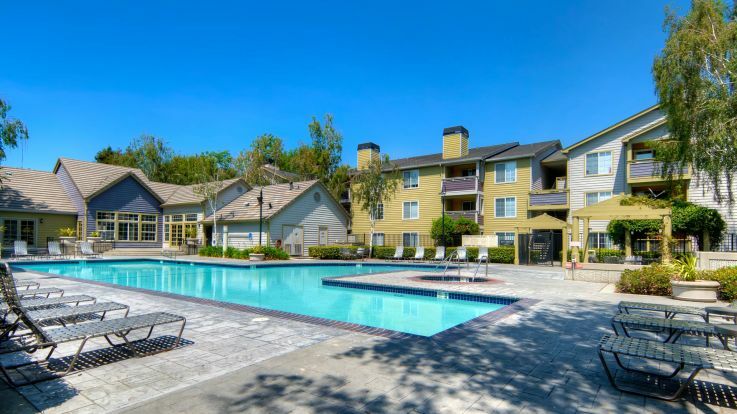 Enjoy luxury living in the South Bay at our Milpitas apartments. Or if they don’t meet your needs consider other terrific Equity Residential properties in Campbell and San Ramon.